Monday evenings are always hectic in our household. M. has a gym class right after school and we usually don't get back before 7 p.m. (well, little H. and I make it back home in between, only to leave again about 30 minutes later to pick up M.). This means we don't have a lot of time for cooking big meals, so we try to keep it simple on those days. 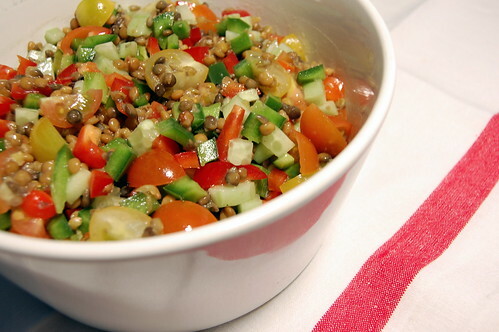 Here's what we had for dinner tonight: a healthy - fast and easy - lentil salad. It's a favorite here so I decided to share the recipe. 1. Pour the pre-cooked lentils in a salad bowl. 2. Cut the seeded red and green bell pepper and cucumber in small dice and mix with lentils. 3. Quarter the cherry tomatoes and mix with the other vegetables. 4. Prepare the vinaigrette, mixing the olive oil, lemon juice, honey, salt and pepper. Taste and add more of one or the other ingredient, according to taste (it shouldn't be too sweet nor too sour...). Add to the vegetable mix. I actually got this vinaigrette from Jamie Oliver's book "The naked Chef", and I believe it goes really well with this salad. 6. Refrigerate for about 30 min. - take out 5 minutes before serving. This salad goes really well with poultry or grilled salmon.